I have been using a Paul Revere tea kettle every day for over 25 years. Is it still safe to use or does the inside corrode? 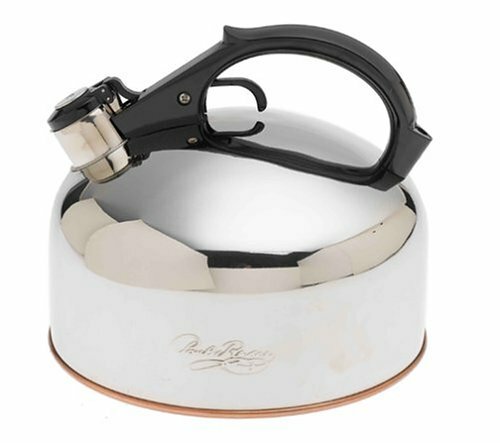 The Revere Ware tea kettles are made from stainless steel and copper. Stainless steel is stainless because the chromium that is added to the steel oxidizes to form a protective layer that prevents the iron in the steel from rusting. This is a self repairing coating; if you scratch stainless steel, the new chromium that is exposed will quickly oxidize to repair the protective layer. Note that the chromium used is not the same as the type popularized by the movie Erin Brockvich. The type of chromium in stainless steel is the same as is typically include in a multi-vitamin and mineral supplement, which supports healthy metabolism. The copper inside a copper bottom tea kettle will naturally oxidize from exposure to oxygen, which will turn the metal a turquoise blue. Additionally, hard water deposits will build up on the bottom and sides of a kettle from normal use. Both of these phenomena are totally safe. Copper is a naturally occurring metal and is an essential element for all living things, and hard water deposits are just minerals in drinking water, which also can be beneficial to the body. To keep your kettle in good working order, it is important to clean the inside occasionally. To clean a kettle, just fill it with vinegar (such as white vinegar) heat it, and pour it out. You can do this repeatedly to get all the hard water out. The vinegar will be very blue when it comes out, from the copper oxidation. Some agitation with a bottle brush can help speed up the process. I followed this process and bit of black flakes came out in the water from the tea pot. Is this normal? We have very hard water. Is this safe to keep using? The kettle is 32 years old. I would expect that if you had very heavy hard water deposits, which can definitely come off in flakes. I suspect the reason they are black is that the hard water deposits are getting charred from the high heat. Do I use undiluted vinegar? Some people say to use equal parts water and vinegar. All vinegar will have some water in it, as it is made from the juice of a fruit, of which quite a large percentage is water. For example, Heinz White vinegar has 5% acidity, which means that quite a lot of it is plain old H-2-O. In our experience with hard water deposits, the stronger the vinegar you use, the better and faster it works at dissolving hard water deposits. We aren’t aware of any reason not to use full strength white vinegar (the type we typically use), meaning, there don’t appear to be any issues of damage to worry about. The only reason we sometimes dilute vinegar for this purpose is to make it stretch longer, for example, when descaling a large pot it would take far too much vinegar to fill it to the top; using a smaller amount of vinegar in water works slower, but is less expensive. In this fashion, we do indeed typically use about 50% vinegar and 50% water for the purpose of descaling our tea kettle, and sometimes pure vinegar if the scale is really bad. My teakettle has very heavy deposits of limescale. I didn’t realize for a couple years what the small flat pieces of hard whitish stuff speckled with tiny black dots I would find in my sink occasionally were. But recently there was a slightly larger piece and I could review “Revere” on it! After looking at various references including this website, I have boiled it with vinegar multiple times and certainly some of the limescale has been removed, but I can still see some in there when I look through the spout using a flashlight. The last time I did it the water turned blue, and in fact I could see some of the copper bottom when I looked through the spout. I would really like to remove the rest of the limescale, but I question how many times I would have to do the vinegar treatment. I am thinking of trying C-L-R, the calcium-lime-rust removal product, but I would like your professional opinion about whether that might damage the teakettle and/or advice about things like how long I should leave it in there. CLR will take the finish off of aluminum and copper. I’m not sure what exactly that means. The copper on kettles has no finish that I am aware of. I think perhaps what is missing is just some agitation. It sounds like your deposits are so heavy, that just vinegar along won’t do it. I would purchase a bottle brush brush that can fit through the opening, and reach down inside and agitate the bottom and sides as much as possible intermittently to help the process along. Are you using straight vinegar? If not, try using vinegar without diluting it. You can also let the vinegar soak in the kettle when hit longer, like 30 minutes, and then try and scrub some of the hard water deposits off. Yes, that vinegar / water will turn blue. That is the color of the copper oxidation that is coming off.